Place 1 cookie in each of 24 paper-lined muffin pan cups. Prepare cake batter as directed on package; spoon over cookies. Bake as directed on package for cupcakes. Cool in pans 10 min. ; remove to wire racks. Cool completely. Spoon frosting into bowl; stir in food colorings. 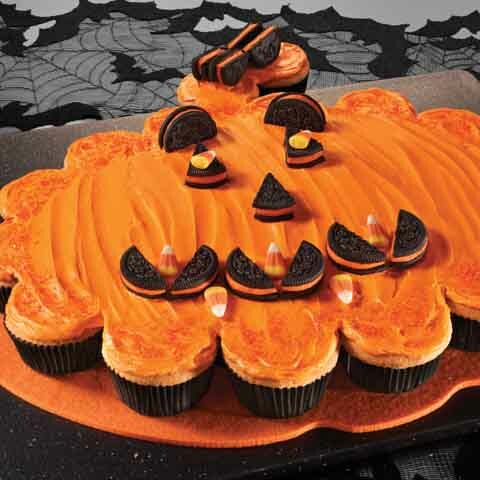 Arrange cupcakes on large plate to resemble a pumpkin shape with stem. (See photo.) Reserve 1 tsp. frosting; spread remaining frosting onto cupcakes. Sprinkle colored sugar around edge. Cut 2 of the remaining cookies in half; place, cut-sides up, on pumpkin stem. Cut each of 3 of the remaining cookies into thirds; arrange on cake for the jack-o'-lantern's eyes, nose and mouth. Cut remaining cookie in half; use for the eyebrows. Decorate cake with candy corn as shown in photo. SubstitutePrepare using your favorite flavor of cake mix. How to Create Your Own Unique CakeLet your imagination run wild and create your own unique cake. 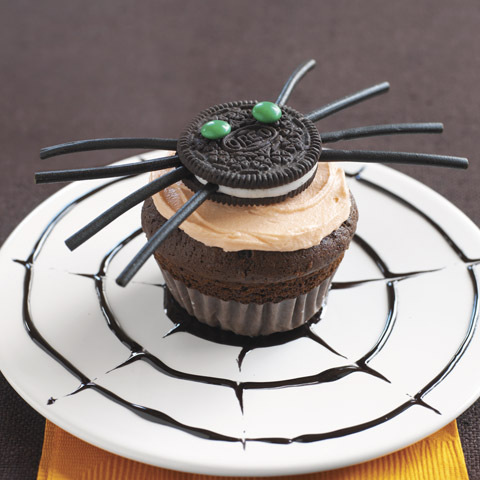 Just assemble the cupcakes into desired shape, such as a ghost, monster or witch face, then frost and decorate. It's easy! 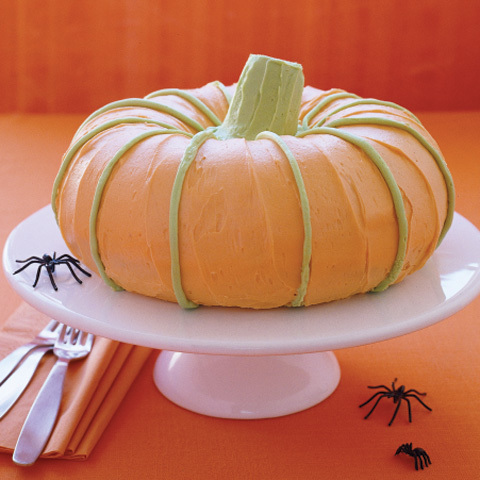 Size-WiseAt 24 servings, this fun recipe is a great treat to serve at your next Halloween party or classroom celebration.